In 2016 the European Football Championship will take place again - an important sports event! However, the real heroes play on training pitches of their clubs every weekend and the real fans come together in their clubhouses to cheer on their local team. Whether in villages or towns, the football clubs are an integral part of our society. 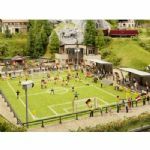 In order to reproduce these scenes in miniature, NOCH presents a small training pitch with clubhouse and plenty of accessories as a New Items Highlight for this year.